The field of competitors looking to bring exascale-capable computers to the market is a somewhat crowded one, but the United States and China continue to be the ones that most eyes are on. It’s a clash of an established global superpower and another one on the rise, and one that that envelopes a struggle for economic, commercial and military advantages and a healthy dose of national pride. And because of these two countries, the future of exascale computing – which to a large extent to this point has been more about discussion, theory and promise – will come into sharper focus. For the United States, that will come in the form of Summit, a pre-exascale supercomputer that is currently being put together at the Department of Energy’s Oak Ridge National Lab that will be powered by IBM’s Power9 processors and more than 25,000 of Nvidia’s powerful “Volta”-based Tesla V100 GPUs. The system, which is due to come online in the spring, will deliver more than 200 peak petaflops of performance, which easily would make it the fastest supercomputer on the Top500 list. Currently sitting atop the list is China’s massive Sunway TaihuLight, a supercomputer that reaches 125.4 petaflops of peak performance and is powered by homegrown Sunway many-core SW26010 processors rather than chips from such U.S. companies as Intel, Nvidia and AMD. The TaihuLight supercomputer and the Sunway chips are part of a larger effort by Chinese officials to have more of the components in such systems built by Chinese companies, both as a way of growing the technology capabilities of those companies as well as an answer to a move by U.S. officials several years ago to ban the sale of Xeon Phi many-core processors to certain Chinese institutions that are using technology not only for scientific research but also military purposes. China has announced plans to spend $150 billion over 10 years to grow the country’s chip-making capabilities. As the United States moves forward with Summit, China also is preparing to launch the first of three pre-exascale systems that will be based on three different architectures. The first of those will be the Tianhe-2A system, a hybrid supercomputer that will use a mix of Intel Xeon processors and the Chinese made Matrix-2000 DSP accelerators and is expected to go online this year. That will be a change for the Tianhe line of the systems. 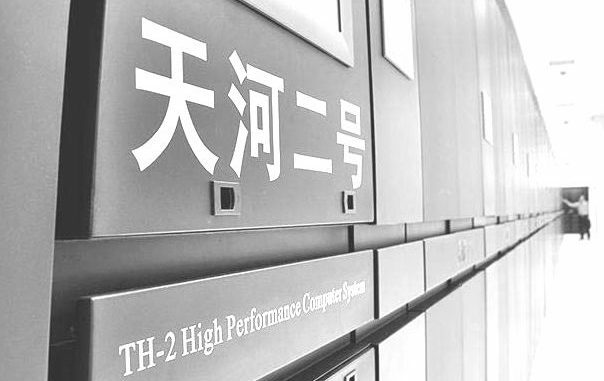 The original Tianhe-1A system, which was launched in 2010 and helped establish China as a player in the supercomputer and HPC field, ran on a combination of CPUs and GPUs. According to China, the Tianhe-2 system, which went online in 2013 at the National Supercomputer Center in Guangzhou, China, and sat atop the Top500 list until it was deposed by TaihuLight in 2015, runs both Xeon chips and Intel Xeon Phi “Knights Corner” co-processors. According to a presentation from Yutong Lu, professor at the school of computer science at Sun Yat-Sen University (SYSU) and The National University of Defense Technology (NUDT) and director of the National Supercomputer Center in Guangzhou, Tianhe-2A (also known as Milkyway-2A) will be biggest and faster than its predecessor. While the Tianhe-2 has 16,000 nodes and a performance of 54.9 petaflops, Tianhe-2A will come with 17,792 nodes – each with two Xeon “Ivy Bridge” CPUs and two Matrix-2000 accelerators – and will deliver a performance of 94.97 petaflops. As can be seen in the chart below, the new system will also have more storage and memory capacity, faster interconnect and greater power efficiency, and will use customized OpenMP and OpenCL software optimized for the Matrix-2000. The system, which was first talked about in 2015 and will be installed at the National Supercomputer Center in Tianjin, will include an accelerator blade that will hold four Matrix-2000 chips, an I/O chipset and a 14G network. The Matrix-2000 itself will have 128 cores and will be packaged into four super nodes, with each super node comprising eight clusters and each cluster holding four cores. It will include eight DDR4-2400 channels and an X16 PCIE 3.0 EP port. The United States and China aren’t the only figures in the race to exascale computing. As we’ve talked about before, Fujitsu is pushing ahead with its Post-K supercomputer that will be powered by customized chips based on Arm’s 64-bit architecture and will be Japan’s entrance into the field when it goes online toward the end of 2021. In addition, at the SC17 show in November 2017, members of the European Union’s HPC community outlined plans for that region to raise its supercomputing profile through a range of initiatives, including Horizon 2020, EuroHPC and Partnership for Advanced Computing in Europe, or PRACE. The goal is to launch two pre-exascale systems between 2021 and 2022 and two exascale systems in 2023. However, it will be the United States and China that come out with pre-exascale systems this year, with exascale systems coming in a few years. The United States, through its Exascale Computing Project, is aiming for the first of its exascale systems – dubbed A21 and based on Cray and Intel technologies – to come online in 2021 at Argonne National Lab. China is planning for the first of its exascale supercomputers for 2020.